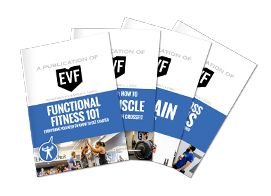 EVF member and Chiropractor Dr. Nick Rozborski walks you through six exercises to better prepare your body for your workouts. If you’re anything like the average American, you’re sedentary for most of the day. (The average American sits 13 hours a day and sleeps 8 hours — a total of 21 non-active hours!) Your body adapts to what you do during the day. If you’re stuck at a desk with bad posture all day, then come to class to overhead squat and push through nice long metcon, your body may get cranky. Luckily, the human body is resilient and you can prepare yourself with some pre-workout exercises. The following exercises will prepare your body for lifting, while also improving mobility, alignment and joint positioning. These are low threshold exercises, meaning you should be able to talk to a friend and breath normally during these. These are not designed to take the place of what the coach has programmed specifically as warm up for your daily workout. These are simply a foundation that can be done daily prior to training — not to drain the body but to energize it! Our first two exercises, the bird dog and the side plank, have been shown by spine researcher Dr. Stu McGill to provide lasting core activation and resiliency in the back for hours after performing. In fact, NFL teams incorporate these before warm ups, practices and games as a prep. Is your lower back bugging you during your lifts? Give these a try. For both exercises, perform 4 reps of 8-10 sec holds, take a short rest, perform 3 reps of 8-10 sec holds, take a short rest, and finally perform 2 reps of 8 holds. Repeat on the other side. Start on your hands and knees; find a neutral spine. Raise one arm forward, and extend the opposite leg straight back. Point the heel, lengthening the leg. With the arm forward make a fist and pull the shoulder back to lock it in. Actively tighten the obliques and abdominals. Both shoulder/arm and leg should be in line with your torso. Hold the position 8 seconds, then switch. Lay on your side, with your elbow directly below the shoulder. Bring your feet back so your knees are at a 90-degree angle, and place your other hand on your hip. Contract your core and raise both hips off the ground, until your body is in a straight line from head to knees. Think about trying to pull the elbow on the floor toward the knee and vice versa. For an extra challenge, straighten one leg at a time until you are balanced on your forearm and the sides of your feet. Hold for 8 secs with tension. The next two exercises —the prying goblet squat and the kettlebell halo — are staple warm ups from kettlebell master Pavel Tsatsouline. These will to help mobilize the hips and shoulders and prepare your body to handle a load. The prying goblet squat should be performed in 30-second holds. Lower into a squat, and actively “pry” the hips open, while pulling yourself deeper into the squat. Use a light to moderate kettlebell. Throw in some bicep curls while in the squat for beach season (and a nice rocking oscillation). In a half kneeling position, hold a KB with both hands. Slowly move the weight around your head as if tracing a halo. Try to not move the head and spine, rather move the bell around using your shoulder blades. Perform 10 alternating rotations, then switch the knee that is down. Next up, a variation of the classic core strength and stability exercise the deadbug called the wall bug. Lay on your back, facing away from a wall. Press both hands into the wall, with hips and legs bent at 90 degrees. You should be in a position similar to an overhead squat, minus the bar and on your back. While pressing into the wall with hands and fingers and your legs at 90 degrees, alternate tapping your heel to the floor 5 times per side. Repeat 2 times per side. Don’t forget to breathe and relax the face and neck. This is a difficult exercise so ask a coach for input if you need help! Last up, the Bretzel — also known as the Best Stretch in the World. This movement helps open up the thoracic spine and the front of the hip. Lay on your side with one knee over a foam roller. With the top hand, grab the foot of the bottom leg, while keeping the hip in extension. Slowly rotate the top shoulder and trunk to the floor, trying to get as flat as possible. Repeat 5-8 times, then hold — taking 3 deep breaths. Switch sides. Dr. Nick is an experienced sports chiropractor and has been a member of EVF since 2012. While chiropractic adjustments are appropriate for some conditions, they are not absolutely necessary, and he offers a wide spectrum of services and education as his standard treatment. If you get pain during certain movements (i.e. low back pain with kettlebell swings or shoulder pain with lifting overhead) or are curious about how to move more efficiently, he can help.